It's going to be a top down, real time multi player, blam, boom em up. It's still early days in the development process. 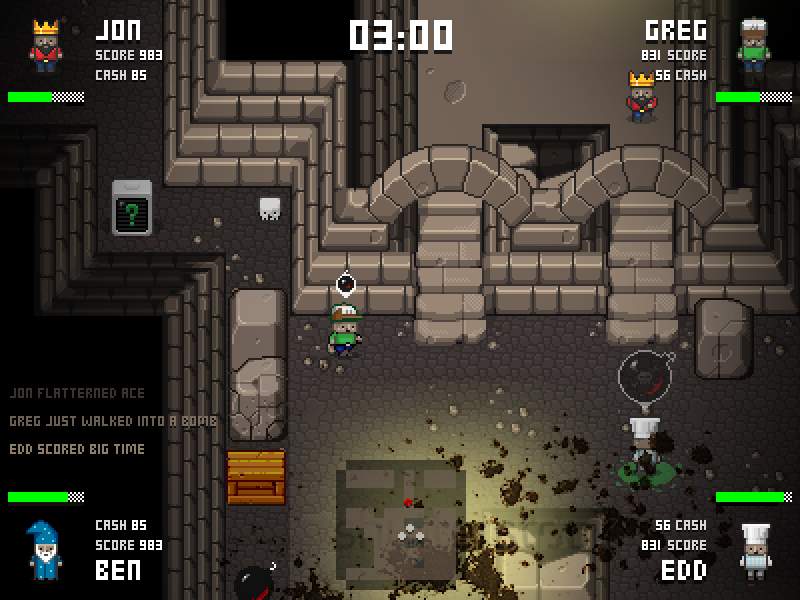 The game will be in heats of 4 players running around dungeons trying to blow each other up with various weapons. Also parts of the scenery will be destroyable for strategic play. Heats will last 3 - 4 minutes and hopefully fast paced. www.last17.com. We are a two person team and most recently I'd released Reprisal which has been floating around in these forums. 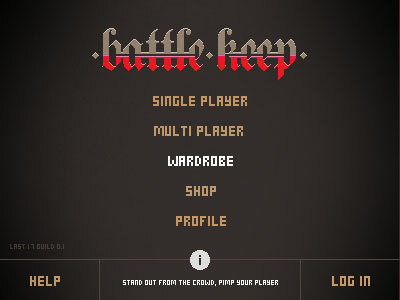 So on this snowy (London) afternoon here's your early bird chance to heat things up and sign up to the Battle Keep private beta. We are releasing limited places so grab one early. Once signed up, we will contact you as soon as the beta is ready to play early next week. Nice to see you've started a new development log and after following Reprisal I'll definitely be keeping an eye out on this one. Will players be able to choose the same type of character or does each game have to use each unique character? 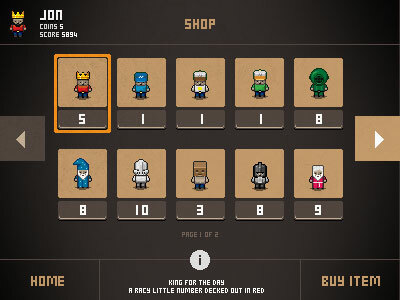 More work has gone into the look of the game making sprites a lot bigger. Also losing a lot of the UI to give it a more arcade feel. 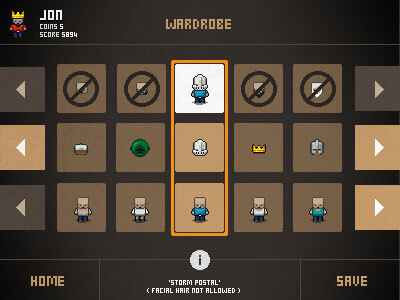 The players are constructed from various layers allowing them to be arranged in different orders for customisation. Work continues behind the scene on multi player scripting etc. This was posted on Saturday showing new sprite / character updates and hud. Really digging the style of this! Time is flying and thought I'd stick an update here. Sections of the game have moved on a lot with a wardrobe, shop etc. 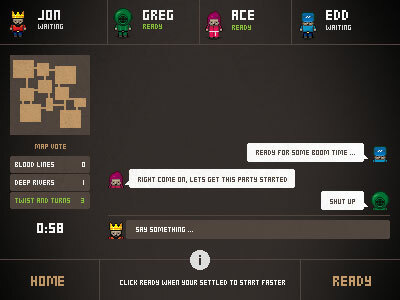 This whole game is kinda of an experiment into real time multiplayer. There was a number of requests wanting Reprisal to have a multiplayer option so this is good R&D for that and future games. We have a rocket under us at the moment to crack this one out - scope creep can be a killer! 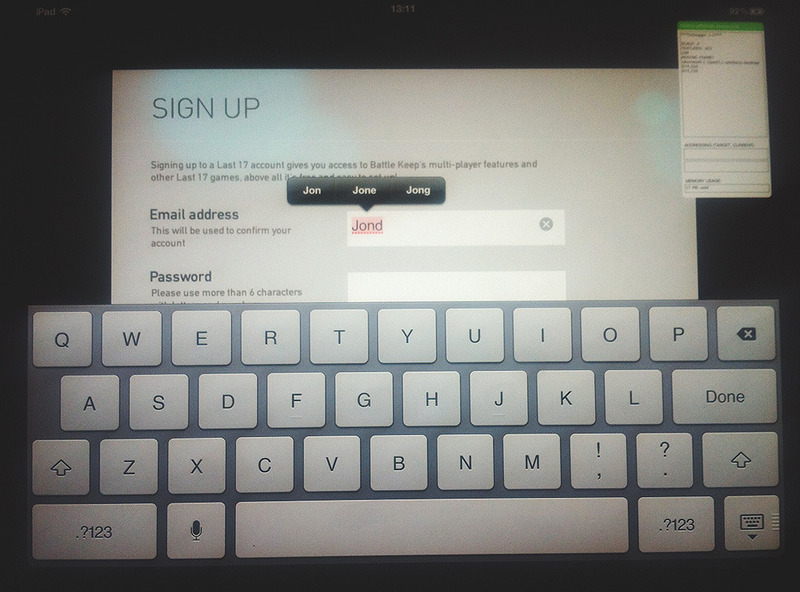 So, AIR + iOS = native inputs. Its a small thing, but oh such a great thing. This bad photo shows the start of the Last 17 Dash board for Battle keep. Keep on booming! 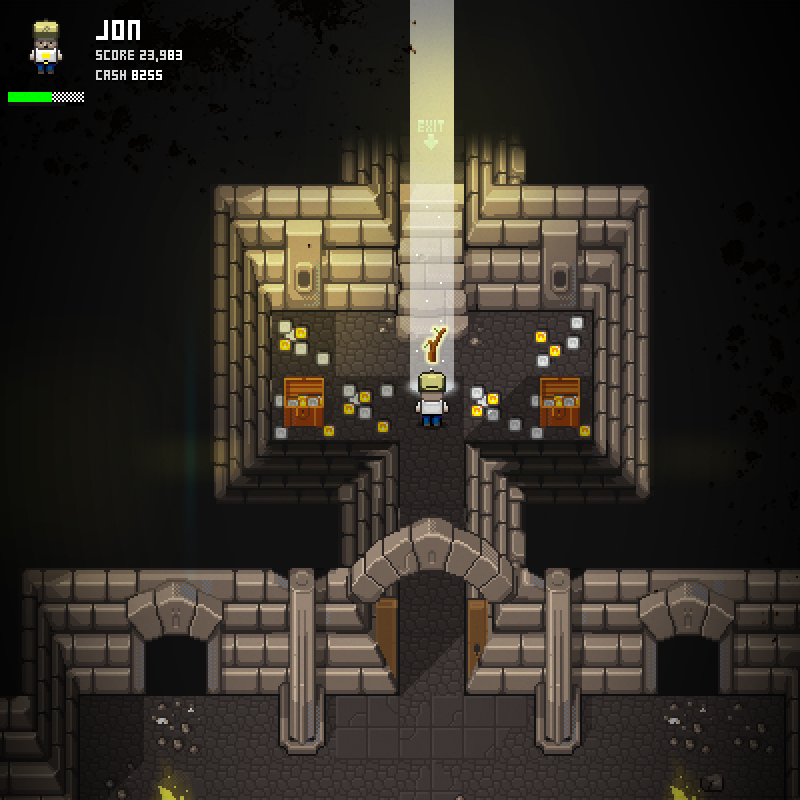 It's been a while since an update but things are slowly moving along with Battle Keep. There has been loads of ground work being done as we finally decided to build our own game framework based on Starling. A 2D physics engine has also been created, which was a brain bender taking X Y with Z and translating back to X and Y! Anywhoo, here's a little chap drawn in one of the new 8 way sprite directions ... which again is taking some time updating all the sprites with the new extra 4 directions! Graphics look great! Very sharp and crisp. The gameplay sounds like a lot of fun too. Looking forward to following the development on this one. Looking good so far. Nice to see some love for AIR. "Code banana. Run in loop. Makes many banana!" Air is very cool, used it on another game (Reprisal - Desktop) and finding for Battle keep it's great for iOS, Android and Desktop releases with minimal code variations. Starling / Stage 3D has kinda blown us away in terms of speed. Still trucking along with this, it's moving and inching closer to a pre, pre, beta release. 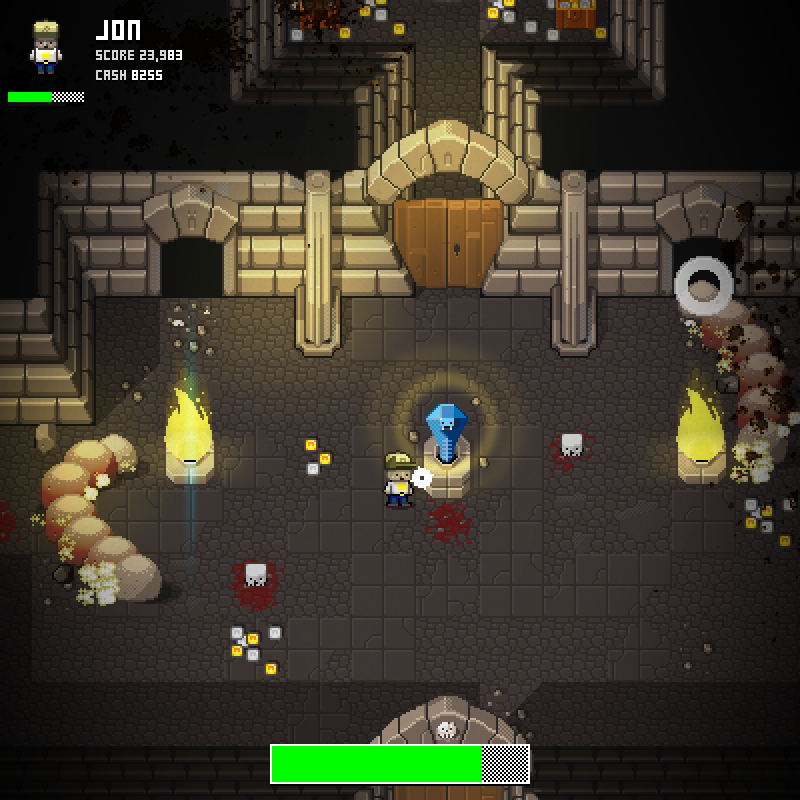 Building a multi-player real time action game has been a tough challenge and we set the bar high with this, especially as we've made our own game framework while building! 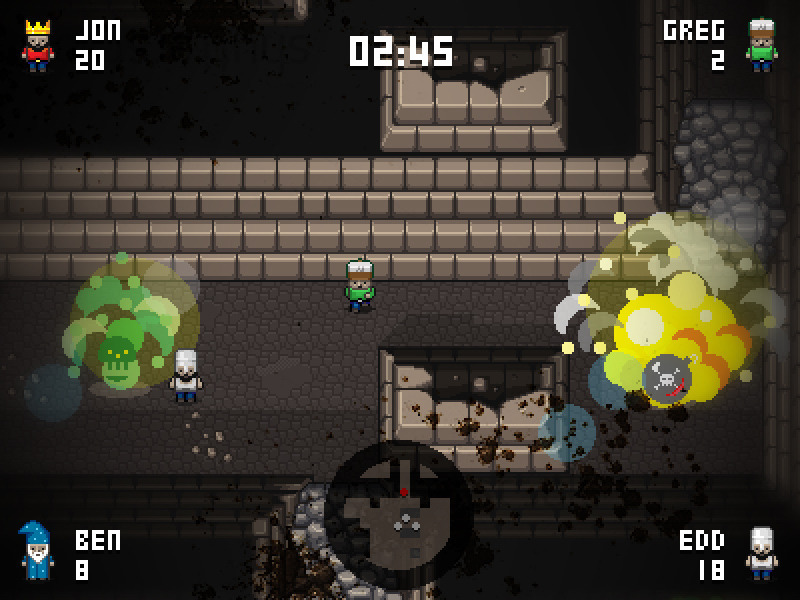 Anyway, particles are working, chat room lobby is working, map votes is up and running and bomb spawns are in action.